Official synopsis: "Trey thought he was an ordinary teenager. Then he meets a mysterious stranger, Lucien Charron – luminously pale, oddly powerful, with eyes that seem flecked with fire and skin that blisters in sunlight. Somehow Trey finds himself in a luxury London penthouse, like a Bond villain’s lair. It’s the heart of a sinister empire, built on the powers of the netherworld – werewolves, vampires, sorcerers, djinns. And Trey himself has a power that’s roaring to break free. Is he a boy or is he a beast?" Again, another book that's been out for a sizable amount of time and I hadn't read until recently. And what a blooming mistake!!!! Seriously, if there was a time machine I would use it to go back to when this first came out so I could of experienced the awesome sooner! Steve writes in such an engaging way that you really get caught up in Trey's story. You can almost feel his utter disbelieve, his anger even, at learning the truth about himself. I found myself really relating to Trey. You just start to get settled, just start getting used to something and then BAMN! Something else happens and you can never stop moving. Vampires, Werewolves and Sorcerers are all pretty popular in YA fiction at the moment and it's hard to really find the stars out there in all that vast space. But Changling is more than a star. It shines bright and captured me unlike a lot of books I've read of late. There's just something about it, the essence of it. The premise. The entire story. The characters. It all just works. Every bit of it clicks and makes for such an amazing read. The writing is so seamless and fits together so brilliantly. It actually hurt me every time I had to put my Kindle down (got this for my Kindle... first brought I bought for it!) and do something else, or like the day I had to go into work with just three chapters left to go. Yes, that's right... 3 chapters left to go!!! Trust me, the pain hit hard and when it was a day I was actually working 9-7 it was even more agony! Never before have I entered the door and disappeared into my bedroom so quick to read. The characters are well fleshed out, and thought out. You can tell they're not just the result of a moments thought as Steve was writing. They all earn their place and you actually care about them, get to know them, and in the case of the bad guys, really, strongly, despise them. The main cast, Trey himself, Vampire mentor Lucien and his daughter Alexa, and their right hand man, Tom, are a great bunch. All so different, their personalities, their attitudes, but yet they work as a unit to fight the dark forces of the evil Vampire Caliban. All in all a thoroughly enjoyable read that has left me itching to read the second book. I actually purchased the next two books in the series Changing: Dark Moon and Changing: Blood Wolf but haven't gotten around to them yet, which is annoying! There is also a fourth book currently out! 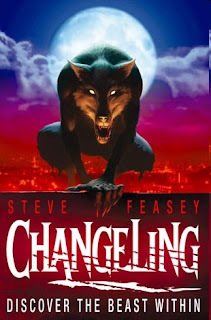 Changeling: Demon Games and with the fifth and final book, Changling: Zombie Dawn due for release next month, there is no better time than now to start reading the series. Who can resist reading them back to back? Do not, do not live your life like the old Ryan, the pre-Changeling Ryan who hadn't read this beauty and didn't know what on earth he was missing! I don't want you to suffer the same way that I did! My thanks to Steve for creating such a brilliant book, and to MacMillan for bringing it to the world! Has any famous autors commented about this book?